Big muscle growth is foreign to your body... and it takes some coaxing into.. 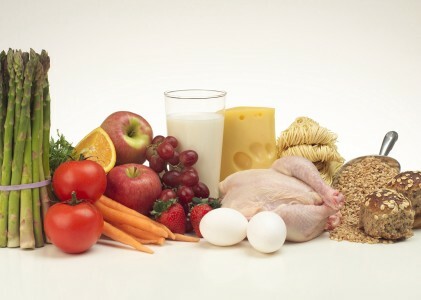 The diet for bodybuilding requires that you eat a healthy, nutrient-dense meal every 3-4 hours. Here is an easy to follow plan or outline for a successful bodybuilding diet. Eat six small meals a day, 2-3 hours apart. A meal should consist of a high-quality protein such as chicken breast, tuna or fish (tuna is one of the healthiest and most convenient), low-fat beef, shellfish, or protein powder. The other part of each meal should be a small portion of a low GI carb. An easy way to do it is just one piece of fruit. And for 1-2 of the meals, make sure it’s a vegetable. So that’s it, six small meals a day that consist of a protein and a low GI carb. You should stack up on the protein. When you’re trying to build muscle, it is important to consume at least 1 gram of protein per lb. of body weight per day. It is virtually fool-proof as long as you keep to it. Now, if you’ve read Body For Life, this is virtually the same thing. Bill Phillips talks about taking one day a week and eating anything you want: the free day. This is what makes the diet do-able and exciting. However, one thing you can do that will really help is on the free day, eat like a freakin pig until the afternoon, and then its back to the diet. The point is to eat like such a fatass that you're nearly sick by the end of the day so that you're motivated for the rest of the week. So the latest you can eat that biggie-sized combo is about 3-4pm. Here is one small loophole. It is proven that you should consume some high-GI carbs within 30 min-1 hour after your workout. This basically means junk carbs. So a sugary drink or a popsicle or any high GI carb right after you work out along with your protein drink can be a little solace everyday in your diet for bodybuilding. Okay, here is the most important part of your diet for bodybuilding. You might already have guessed; get a journal and write down everything you eat and the basics facts: calories, how many carbs, how much protein, etc. This way you can keep track of what you eat and the corresponding results. If you are still maintaining your body weight, lower calories or vice versa if you want to gain. You will learn more about yourself and your body than you will believe. And go crazy on your free day!